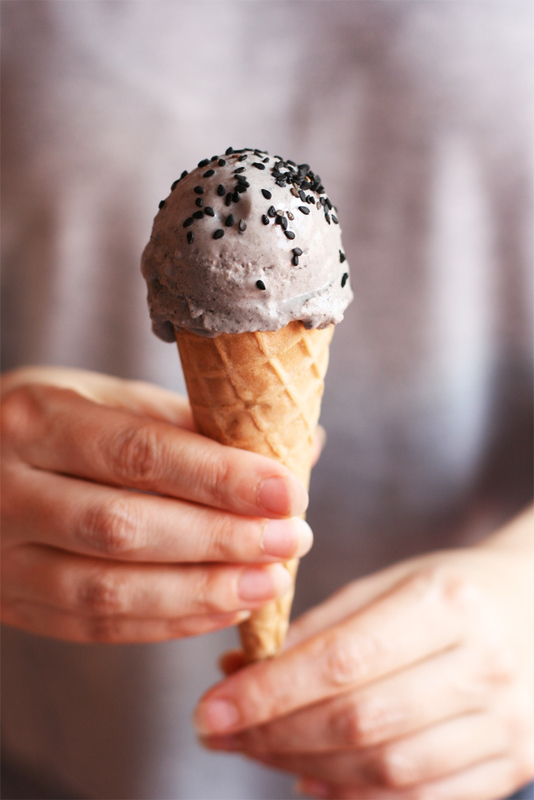 I tasted black sesame ice cream for the first time two summers ago when I was enjoying a delicious lunch with my sister. We were at one of our favorite veggie restaurants in Barcelona and of course I was looking forward to try their new plant-based ice creams (I always leave room for dessert! haha). Truth be told I almost ordered their chocolate ice cream, I doubted that the combination of tofu and black sesame could make a yummy ice cream cause: one, my tastebuds are very well trained when it comes to detect a truly delicious ice cream (vegan or not), and whenever I've ventured to try new vegan ice cream flavors I've ended up utterly disappointed...and two, I was afraid the tahini they used had a bitter taste (some tahini brands have a really bitter taste, yuck). But I finally decided to try that 'exotic' flavor and oh boy what a nice surprise it was! I didn't expect it to be so creamy, rich and delicious, but it was. Whenever I go out to eat and I fall in love with a certain dish I know that as soon as I get home I start thinking about recreating it...and this is what happened last weekend. 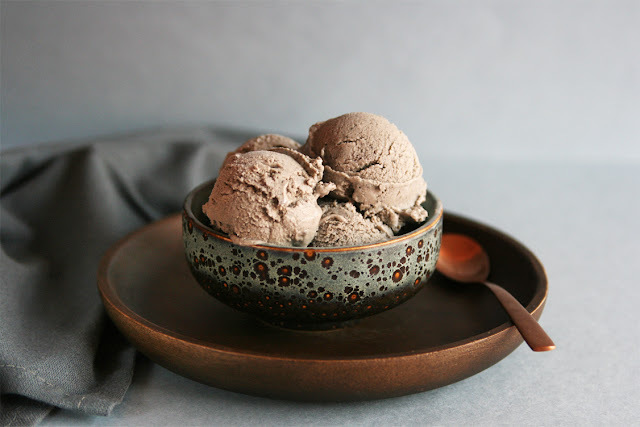 I finally put the bowl of my ice cream maker back to the freezer after several months 'hibernating' inside a box, bought silken tofu and black tahini and worked my magic. 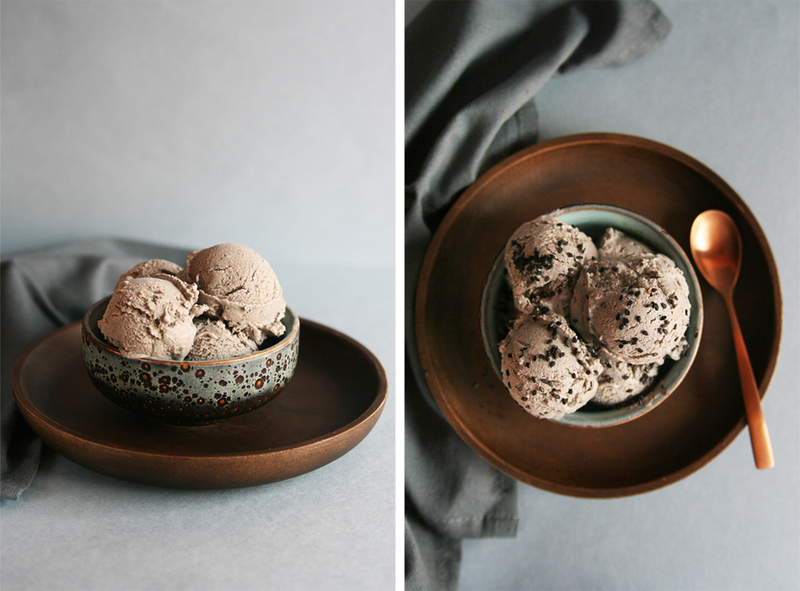 Honestly I thought I'd need a few tries to get the right consistency and flavor but the ice cream gods were by my side that day and the first batch tasted amazing so here I am sharing with you my recipe. I couldn't keep all this deliciousness just for myself and well all need some good summer vibes, am I right? 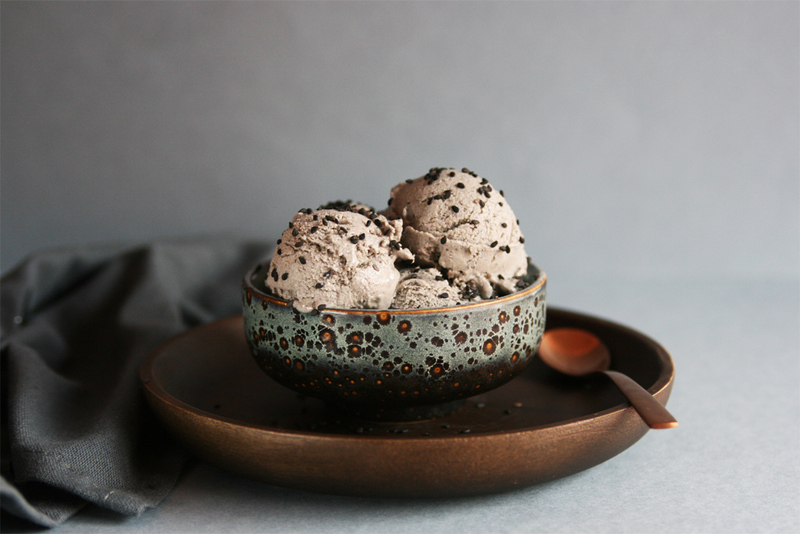 Don't be afraid by the black tahini or the tofu in this recipe, this ice cream doesn't have a weird taste, it is creamy and definitely different from what you may have tasted before but it's super yummy. I am a fan of the classic vanilla flavor but it's nice and fun to try new things and play with different ingredients to step out of boredom. Plus look at that beautiful grey color! 2 cups full-fat coconut milk. 340 g/12 oz silken tofu, drained. 1/2 cup unrefined whole cane sugar. 2-3 tablespoons black tahini (black sesame seed butter). Black sesame seeds, for sprinkling. Before proceeding make sure the silken tofu is well drained. Cut it into cubes and place inside the container of your blender along with the coconut milk, sugar, cornstarch and vanilla. Blend on high speed until well combined and smooth, you might need to stop and scrape down the sides of the container a couple of times. Transfer the mixture to a medium saucepan over medium heat and cook, stirring frequently until a low boil begins. Reduce the heat and cook for a minute more or so until it looks slightly thicker. Remove from the heat, transfer the mixture to a heatproof bowl and add in the black tahini starting with two tablespoons, then taste and add an an extra tablespoon or two if your tahini doesn't have a strong bitter aftertaste. You won't notice any weird aftertaste by adding 2 to 3 tablespoons, the sugar and coconut milk will help a lot. Cover the surface of your ice cream base with plastic wrap to prevent any skin from forming and let it cool completely at room temperature. Once cooled transfer to a shallow freezer-safe container, cover the surface with plastic wrap again and put the lid on. Refrigerate the ice cream base for at least 3 hours, it is very important to have a really cold mixture in order to get a creamy ice cream later. Churn following your ice cream maker's instructions, I churn mine for 30 minutes and always have to keep the container in the freezer for at least 24 hours before proceeding. Once churned the ice cream will have a soft serve consistency, transfer to an airtight container and let it set in the freezer until solid. Let the ice cream thaw at room temperature for 15 minutes or more, it will be rock solid at first but don't worry, it'll become soft and scoopable if you have a little bit of patience (trust me!). 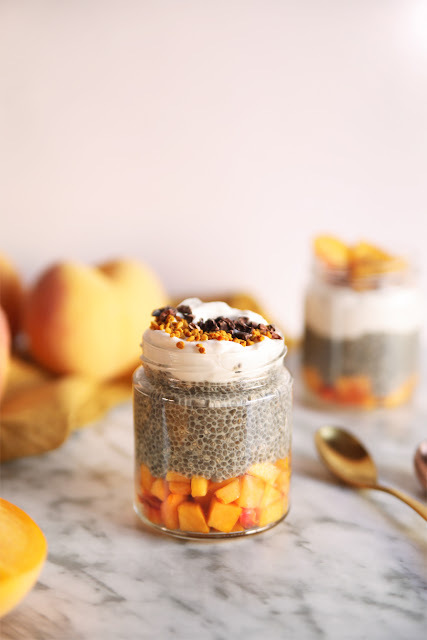 Sprinkle some black sesame seeds on top before serving and enjoy! Simply luscious! 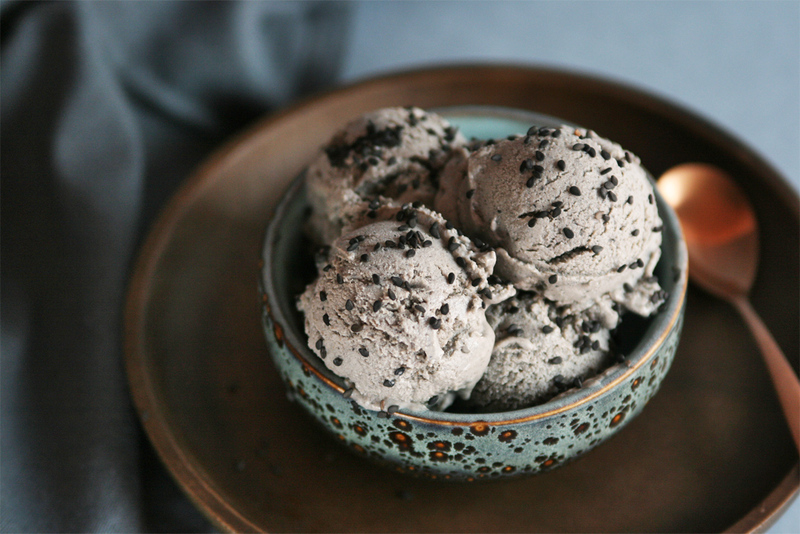 Black sesame really doesn't get enough love in general. I'm so glad you gave it the proper spotlight in this stunning frozen treat. What a creative recipe! 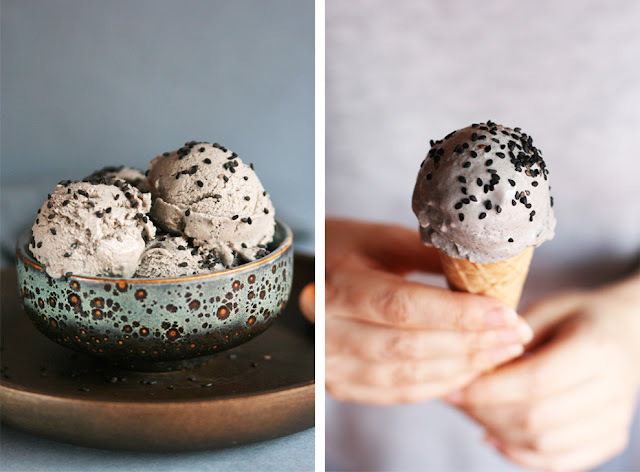 I love vegan icecream...definitely going to have to try this! Stunning photos! Thanks a lot Caroline and welcome to my little blog! 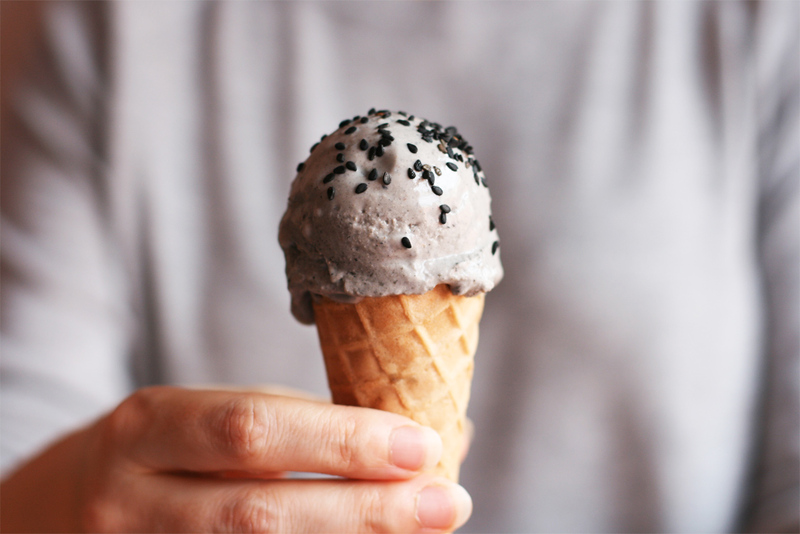 Hope you like it once you try this ice cream.